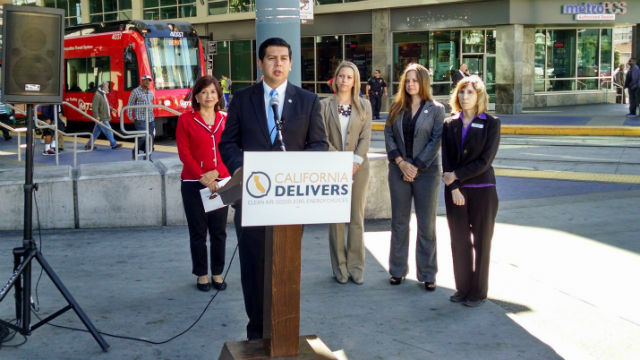 With the busy City College trolley station as a backdrop, local government leaders on Tuesday called attention to $2 billion in new funding for environmental projects under California’s innovative “cap and trade” law. Chula Vista Mayor Mary Salas, San Diego City Councilman David Alvarez and San Diego Unified Board Member Richard Barrera gathered in support of Assembly Bill 32, the California Global Warming Solutions Act of 2006, which will provide $2 billion in funding for transit, energy-efficient housing upgrades, and new affordable housing. The funding comes from a process known in environmental circles as “cap and trade.” The state sets a cap on greenhouse gas emissions, then sells permits — the “trade” — that allow industries to release pollutants. Industries that find innovative ways to curb pollution can sell back their permits, creating a market for reducing greenhouse gas emissions. “The solutions exist and the companies that provide them are located right here in San Diego,” noted Shannon Casey of Cleantech San Diego, an non-profit industry group promoting a sustainable economy. The bill expires in 2020, but supporters are urging that it be extended, with continued funding for environmental projects. The San Diego Unified School District board will vote Tuesday evening on a resolution supporting the bill’s extension.